The countries of the Commonwealth of Independent States (CIS) have further strengthened their collaboration towards affordable medicines by agreeing to a development plan for the Pharmaceutical Pricing and Reimbursement Information (PPRI) network for the CIS during the network’s second meeting. This informal plan ensures the network becomes self-sustaining with participating countries taking on direct management. 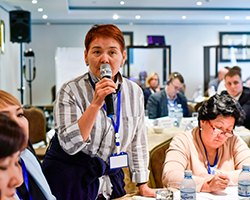 Thirty-six representatives from 10 countries attended the meeting in Baku, Azerbaijan, on 15–16 May 2018, which was organized by WHO/Europe in collaboration with the Austrian Public Health Institute. The event was a platform for participants to share and compare their experiences and reflect on challenges ahead. Pricing and reimbursement of medicines was the main focus, with the agenda covering topics such as financial coverage for HIV, tuberculosis and hepatitis medicines in situations where funding is making the transition from donor-funded programmes to domestic resources. Another topic of interest was the management of intellectual property rights for medicines and how countries can make the most of existing agreements in order to foster generic competition and get the best prices. Financial access to medicines is a priority matter in the health system strengthening agenda of countries in the WHO European Region. Out-of-pocket expenditure on medicines is regularly reported to account for the highest burden on households’ private expenditure for health. This issue must be addressed by governments in order to achieve universal health coverage. The CIS PPRI network will play a key role in achieving this.